StampCircuit Club is the largest On-Line Stamp Portal, bringing stamp collectors and auctioneers together for over 15 years. On StampCircuit you can find hundreds of thousands of stamps, envelopes, covers and other philatelic items auctioned by over 150 Stamp Auctioneers and Dealers working with us. We at StampCircuit Club are dedicated to providing you with the most enjoyable experience, whether you are searching for items or participating in auctions. And now, with our new Saved Searches feature you can be sure to find what you're looking for, without missing an item. StampCircuit is not involved in any aspect of philatelic trade. Furthermore, all correspondence, including bidding, is done directly with the Auctioneer. Our goal is to bring you all the latest Stamp Auctions, Auction Realizations, News and Events, in a convenient and easy to use format. 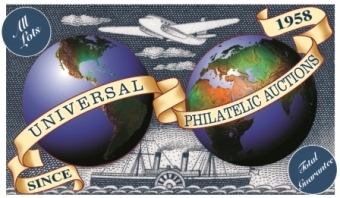 StampCircuit Club is your One-Stop-Shop for all things Philatelic.